Growing high quality grass for sports fields requires a careful controlling of moisture and temperature at roots of the grass. Sensors for measuring these quantities need to be completely buried type not to affect the activities on the ground. 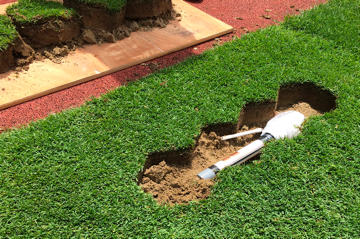 In communication from the underground to the aboveground, design of a more efficient antenna is required in order to deal with problems caused by changes in the condition of the soil, especially changes in moisture content. In this research, based on data obtained through field experiments, we aim to develop a high efficiency antenna which earns stable gain regardless of soil moisture changes.